LOUISVILLE, KY. — The Louisville Sports Commission recently announced that former Buffalo Bills quarterback and Hall of Famer, Jim Kelly, will deliver the keynote speech set for January 28, 2014 at the Paul Hornung Award Banquet located at the Galt House Hotel in Louisville, Kentucky. 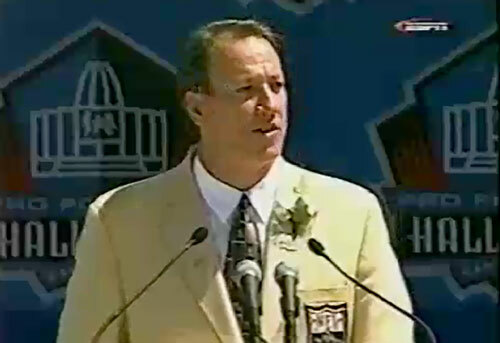 Photo shows Jim Kelly delivering his Hall of Fame speech in 2002. The Hornung Award was established in 2009 to honor Paul Hornung, a Flaget High School graduate and Heisman Trophy winner at Notre Dame. Today, the award recognizes the most versatile player in college football. Past winners include West Virginia’s Tavon Austin and Georgia’s Brandon Boykin. Kelly led the Bills to the playoffs eight times. In 17 playoff game appearances, including four consecutive Super Bowls, he passed for 3,863 yards and 21 touchdowns. At the time of his retirement, his 84.4 passer rating ranked sixth all-time and was second when compared to Hall of Fame quarterbacks. In 2002, in his first year of eligibility, he was inducted into the Pro Football Hall of Fame. In 2013, Kelly was diagnosed with cancer of the jaw but today he says he is cancer free after undergoing successful treatment. If you would like to book athletes like Jim Kelly for an event, contact Sports Speakers 360’s booking agent for appearance & speaker fees or call 1.855.303.5450.